For over 30 years, Carolee has designed jewelry and other accessories for prestigous department and specialty stores worldwide. 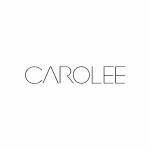 Established in 1972, Carolee set out to produce a product that was significantly different from what existed and she had a commitment to quality and to marketing to women that set her apart in a very competitive industry. Through the years, women have come to know Carolee as representing sophiscation, confidence and style. Add a touch of glamour to your look with this forever a classic set from Carolee. A sparkling additional to your special event or any day you need a pick me up. Clear crystals set in silver. Necklace has lobster claw closure and 16-18 inch adjustable length. The bracelet is 7 inches with a fold over clasp closure. The crystal encrusted earrings that are fit for a Princess have a 1.25" drop and are pierced on French wire. A sparkling addition to your wrist and ears. 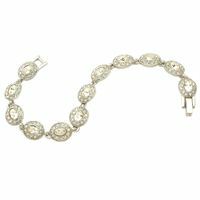 The bracelet features clear crystals set in silver. Measuring 7" with a fold over clasp closure. 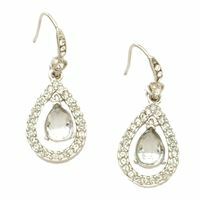 The crystal encrusted earrings that are fit for a Princess have a 1.25" drop and are pierced on French wire. Pearls and crystals are not just for special occasions anymore. Treat yourself by adding some sparkle to a casual weekend outfit or a playdate at the park. With Carolee's affordable pearls and crystals the sky is the limit when you accessorize your wardrobe. Stunning pave crystal fireballs add flair to the white simulated pearls all topped off with yummy pave stud earrings that make you want to wear a ponytail seven days a week. The Carolee Three Row Crystal Bracelet and Petite Pave Hoop Earring Set. Whether you are walking the dog or the red carpet, you will radiate glamour when you slip on Carolee's crystal bracelet and pave hoop earrings. Bracelet measures 7". Silvertone lobster claw closure with signature Carolee heart charm. Earrings are pierced with bullet back stays. 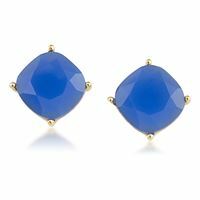 A bold blue color in a classic setting makes this pair of stud earrings a must-have for a season filled with color. With a design always in style these pierced earrings are for day or evening looks. Blue Resin Stone. 12K Gold plated. Pierced with surgical steel posts. Measures 3/8" x 3/8". 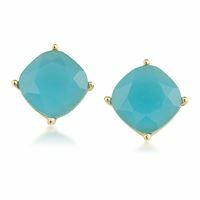 A soft sea green color in a classic setting makes this pair of stud earrings a must-have for a season filled with color. With a design always in style these pierced earrings are for day or evening looks. Sea green resin stone. 12K Gold plated. Pierced with surgical steel posts. Measures 3/8" x 3/8". 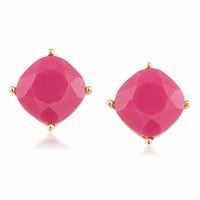 A vibrant pink color in a classic setting makes this pair of stud earrings a must-have for a season filled with color. With a design always in style these pierced earrings are for day or evening looks. Pink Resin Stone. 12K Gold plated. Pierced with surgical steel posts. Measures 3/8" x 3/8". 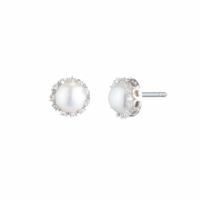 A luminous white color in a classic setting makes this pair of stud earrings a must-have for a season filled with color. With a design always in style these pierced earrings are for day or evening looks. White Resin Stone. 12K Gold plated. Pierced with surgical steel posts. Measures 3/8" x 3/8". 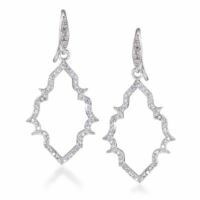 Get Kate Middleton's Royal Wedding earrings from Carolee! 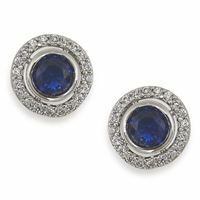 Everyone will be asking about your jewelry - especially these crystal encrusted earrings that are fit for a Princess. Pierced. Length 1 1/4 inches. 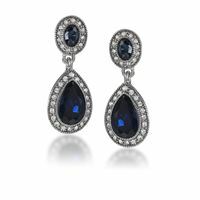 Elegant and chic, a deep blue teardrop shaped crystal is surrounded by dazzling clear crystals. Blue crystals. Clear crystals. Silvertone metal. Pierced with Surgical Steel Posts. Measures 1.25" in Length. Keep them guessing! 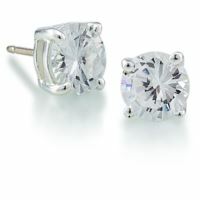 Dazzling round cubic zirconia stud earrings set in sterling silver. Only you'll know they're CZ!. Pierced. 2.5 cts total weight. Fall in love at first sight with these long linear pierced earrings. You will be simply irresistible in these sparklers. Clear Glass Stone. Crystals. Silvertone metal. Pierced with surgical steel posts. Length appox 2 inches. 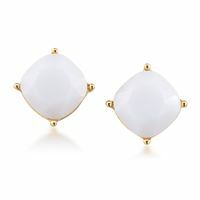 Now you can create multiple stunning looks with this luminous pair of round button earrings. These versatile sparklers can be worn by everyone - from the classic career woman to the mother of the bride. Sapphire glass stone. Clear crystals. Silvertone metal. Pierced with Surgical Steel Posts. Appox. .4" in diameter. 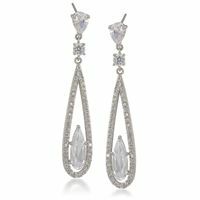 Be the belle of any ball with these radiant drop earrings! White hand-polished simulated pearl. 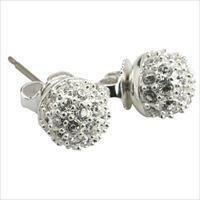 Pave crystal set in silvertone. Pierced with surgical steel posts. Apox length 3/4". Bold and beautiful, these updated cushion drops add the finishing touch to a contemporary style. 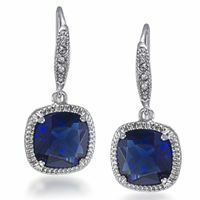 The rich sapphire color creates a modernized, yet elegant appeal for your ideal look. Sapphire glass stone. CZ Crystal. Silvertone setting. Pierced. French wire. Fresh aire. Drink it in wearing delicate white pearl drop earrings. You're sure to feel freshed. White hand-polished simulated pearl. Pierced with 1" drop. 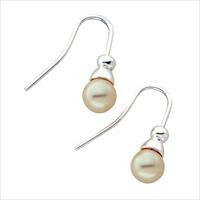 Be a classic in 8mm white pearl drop earrings. Why some things never go out of style. White hand-polished simulated pearl. Pierced with silvertone eurowire. Apox length .75". The Carolee Petite Pave Hoop Earrings. They won't know if these little charmers are imitation or the real thing. . . .and they wouldn't dare ask. Pierced with bullet back stays. Coordinates with the Carolee 3-row crystal bracelet. Sparkle like the jewel you are! Open frame drops dangle flawlessly to create pure elegance. 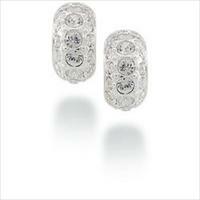 This stunning pair of CZ earrings is ideal that special occasion. They will be cherished for years to come! Pierced. 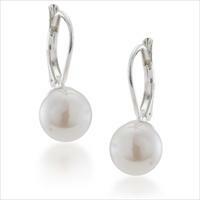 Whether you come by cab or convertible, you'll always arrive in style wearing white pearl earrings. White hand-polished simulated pearl. Antiqued silver. Surgical steel post. Length 3/4 inch. The Carolee Three Row Crystal Bracelet. Walk the red carpet wearing Carolee's three row crystal bracelet and you will be on everyone's A list! 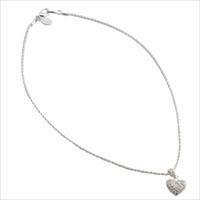 Measures 7" with lobster claw closure and Carolee's signature heart charm. Starlight. Star bright. 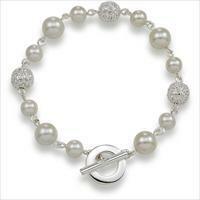 Wish for CAROLEE's pavé crystal fireball and pearl bracelet tonight. Alternating sizes of simulated pearls and pave set fireballs add a delicate touch to your little black dress. Measures 7 1/4" in length. Silvertone toggle closure. Add a touch of glamour to your look. The perfect accent for "I do" and years to come. Clear crystal set in silvertone. Length 7 inches. Fold over clasp closure. When WOW is just not enough, this gorgeous gold link bracelet will transform any outfit into a dramatic look. Show off your wrist in the noticeable way. Goldtone. Rolo link style bracelet. Toggle closure. 7.5" in length. 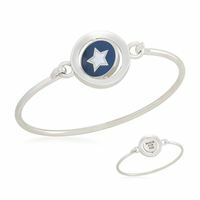 The Word Play Double Take Collection - a sentimental assortment of bangle bracelets designed to showcase your interests and inspirations. Wheather you are shopping for a friend, sister, mother, spouse or yourself, there is a personalized meeting for everyone! Wear your story, share your story. Engraved "reach for the" spins to show a white star on blue background. Hook closure. Silver. The Word Play Double Take Collection - a sentimental assortment of bangle bracelets designed to showcase your interests and inspirations. Wheather you are shopping for a friend, sister, mother, spouse or yourself, there is a personalized meeting for everyone! Wear your story, share your story. 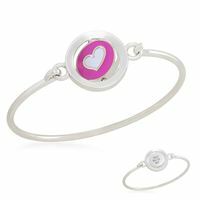 Engraved "You have my" spins to show a white heart on pink background. Hook closure. 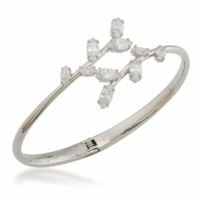 Botanical floral is the prettiest in the cubic zirconia and most feminine message for any season. Hinged design allows for easy on and off. Appox. 2.6" diameter. Silver finishes add a touch of elegance to this darling high shine single row freshwater pearl bracelet with cz filigree magnetic closure. Measures appox 7.5" length. 8mm freshwater pearls. 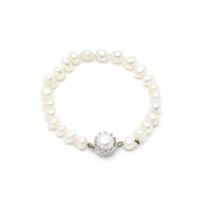 Make a statement with this freshwater pearl bracelet from Carolee. Large freshwater pearls with baguette encrusted magnetic clasp. Appox. 7.5" in length. 12mm and 13mm freshwater pearls. The power is in the pearl. 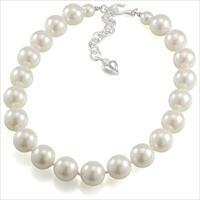 Show off your chic-est angles with this stunning single row necklace, a dream combination of large, freshwater pearls. Large Freshwater Pearls. Measures 16" in Length with 2" extender. Lobster claw clasp with Carolee "C" charm. The more the merrier. 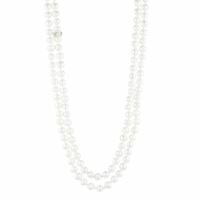 This dazzling freshwater pearl with cubic zirconia can be worn long or wrapped, perfect for the woman who needs it all. 10mm Freshwater Pearls. 64" in Length. Your dream studs. These filigree set pearl earrings match extravagant designs with sophisticated shapes to deliver the perfect accessory for day or night. Pierced. Set in silver tone metal with cz accents. 10mm freshwater pearls. 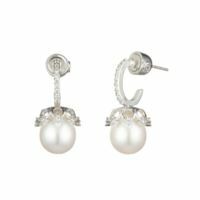 Soft yet chic, these stunning cap stud earrings marry freshwater pearl, cubic zirconia pave and handcrafted settings to create a look that is out-of-this-world. Pierced. 10mm freshwater perals. 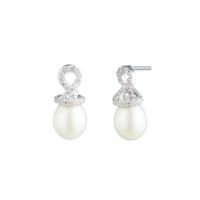 These earrings are simply pearl-fect with cubic zirconia. 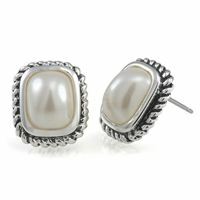 Pair with your favorite strand for a look that screams "chic". Pierced. 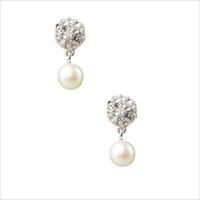 10mm freshwater pearls and cz set in silvertone metal. Appox 0.5" drop. For the girls who go bold. 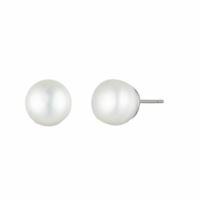 These 14mm freshwater pearl studs give off just enough shimmer to get you party-ready without going over-the-top. Pierced. 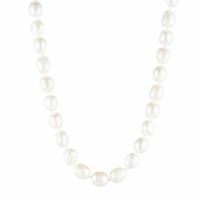 Arrive in First Lady style with CAROLEE's contemporary 16mm simulated pearl choker necklace with silvertone hook closure with Carolee heart charm. Adjusts from 15-18 inches in length. Gift packaging available. Forever a classic. A sparkling additional to any strapless gown, whether it's a wedding or a dinner party. Clear crystals set in silver. Lobster claw closure. 16-18 inch adjustable length. A classic she can wear everyday. Carolee's pave heart necklace. A 16" silver rope chain holds pave set crystals in a puffed heart pendant. Lobster claw closure. Silver plated with e-coat for anti-tarnish finish. 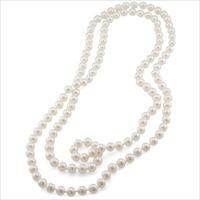 The Carolee 72 Inch 10mm White Simulated Pearl Rope Necklace for women with persuasive power. Coordinate with the 4-row coil bracelet for a "NOW" fashion statement. Measures 72" in length. Can be wrapped several times for a multi-layered look.